These are just a few of my clocks that have appeared in publications over the past several years. The clock on the left, a Lyre Banjo Clock based on a ca. 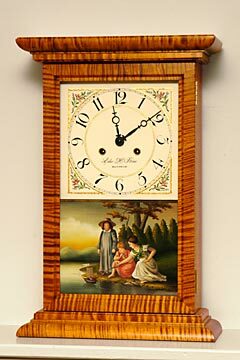 1825 design by Boston clockmaker John Sawin, appears in the April, 2004, issue of Fine Woodworking. The clock on the right is an Aaron Willard gilded brides banjo clock that appears in my article “Gold, Glass, and Eglomise” in the February, 2004, issue of the NAWCC Bulletin. October 2004 Bulletin of the NAWCC / copyright 2004 by the National Association of Watch and Clock Collectors, Inc.
Used by kind permission of the NAWCC. February 2001 Bulletin of the NAWCC / copyright 2001 by the National Association of Watch and Clock Collectors, Inc. 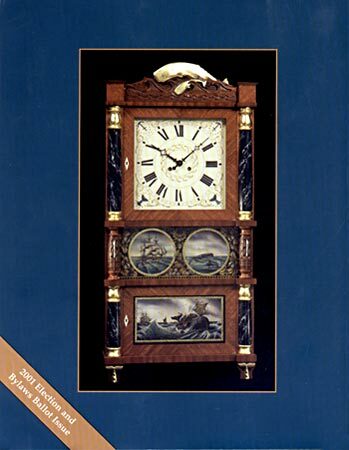 The National Association of Watch and Clock Collectors, of which I am a member, chose my Dolphin Lyre Clock (left) for the cover of the October, 2004 NAWCC Bulletin. 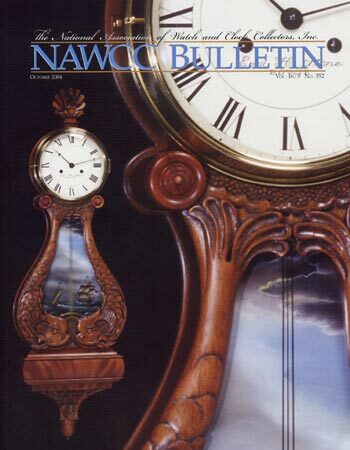 The Triple-Decker Connecticut Shelf Clock with whaling motif at right appeared on the back cover of the February, 2001 issue of the NAWCC Bulletin.